The international goodwill Canada earned in places like Vimy Ridge is evaporating. Canadian heel-dragging on climate is being compared to Japan on whaling; not a favourable comparison. 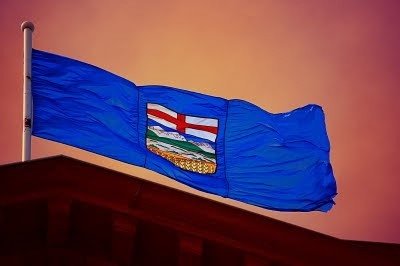 As we've seen with the passing of Bill 50, the current Alberta Government will remove regulatory oversight and mortgage your future if it suits them, despite strong opposition. Rather than representative democracy we are treading perilously close to petro-dictatorship. In the next Alberta election, we will have a choice about what to do with our government. Dragging the political spectrum even more to the right is not a recipe for the change we need, but dragging it left won't work either. It's time for a return to what's important: Genuine civic engagement is essential to a thriving democracy. A change to our voting structure is important because all Albertans deserve a voice at the table. To make progress, we need progressive systems both inside and outside of the traditional power structures. First, inside the system, we must bring election results in line with voting. The current 'first past the post' system breeds voter apathy. If you think your riding is decided even before you vote there's little practical advantage to bother. You've already won or lost. People don't vote because their vote doesn't matter. Changing the system would make their vote mean something, even if they're in a riding that's already decided. Build an Alberta solution based on voting systems like Single Transferable Vote and Proportional Representation. Changing the system is tough because the existing system benefits those already in power. As citizens we need to demand electoral reform so that we will be more accurately represented in the halls of power. Outside the system, an engaged public is essential to making democracy work properly. It's too easy to be a free-rider, hoping someone else will make good decisions for you, and saving you the trouble. But comprehensive solutions only come out when enough people are engaged in the process. As Bill 50 has shown, being a free-rider puts government policy firmly in the hands of large corporations who know how to work the system for their own ends. Not yours. 1st step could be to assign committee seats based on % of voter support, rathaer than on seats won. Alberta politics is the best in the country and hardly needs "fixing". As a kid my dad told me - If it ain't broken, don't fix it. Seems to me that applies here. Having lived in various provinces and experienced firsthand the different political cultures, I've got to disagree with the second anonymous commentator. Most of Alberta's political culture is brutal and regressive if one values democratic dialogue, scientific sociological analysis, and ecological economic progress. I would argue that the political data (voter turnout, unwillingness to collaborate, and dependence upon certain socio-political myths for the basis of policy) favours the sad fact that we need to improve mucho. 53% of the popular vote should not get you 87% of the seats. There seems to be a fundamental disconnect with the amount of votes received. Also, this is on 40.6% voter turnout. The lowest ever. So you've got the expressed support of just over 20% of the people giving virtually dictatorial power to one party. It works really well if you're the power that benefits from the system, but if you're looking for a system that engages the electorate and represents them fairly, then from a straight up mathematics perspective, we're a dismal failure. All sides should be able to see the disconnect there. A change in the electoral system is appropriate to remedy this disconnect.